More than 90 percent of a building’s heat gain is radiant, meaning the sun’s rays are absorbed and converted to heat. Air-conditioning represents more than 20 percent of a commercial building’s energy consumption. 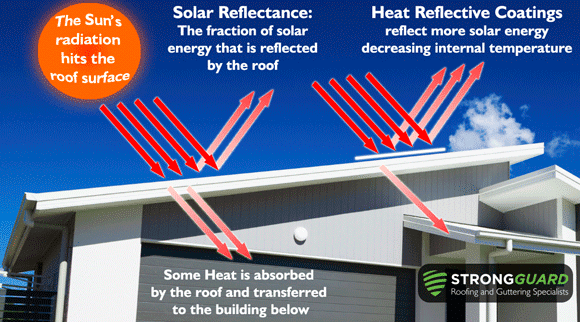 Reducing the heat gain of a building reduces the energy needed to cool the building, which reduces energy costs. Strongguard Cool Roof Technology not only lowers the temperature inside the building, but helps to reduce the effect of ‘urban heat islands’, lowering overall air temperatures in communities.